This car has a alluminum chassis plate, like most cars of it's time. 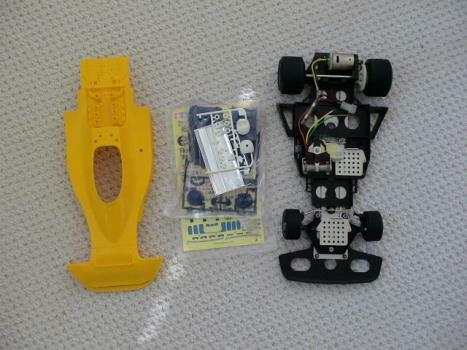 On this the plastic parts (front bumper, the radio / servo tree in the middle, and the rear gearcase) are bolted on. The pinion gear drives the differential gear directly, simple but effective. It's whole design doesn't have anything complicated, the 'suspension' is chassis flexability! 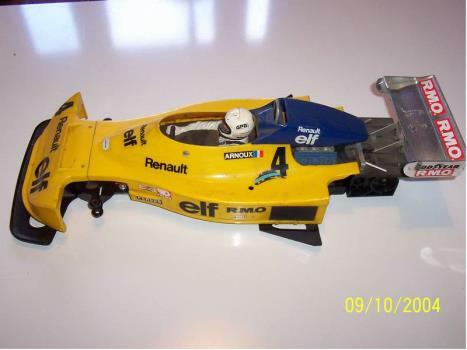 This must have been easy to build, and it's finished of with the nice and very realistic body of the Martini Mk.22 Renault. 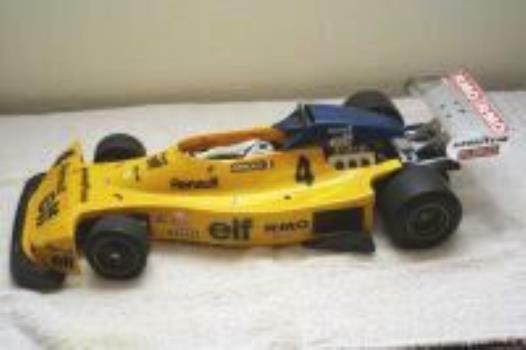 The real F-2 car was driven by the French drivers Arnoux (with number 4) and Pironi (5) in about the same time the model was released (1979). Things to look for in these cars is the presence of the F-2 380 gear case and motor, the front bumper, and the body with origional decals. The parts most likely to be missing are the rear view mirrors: even on my new built one they are missing and I still haven't been able to aquire them. This is my oldest model to date, and also the nicest in my opinion. I think this car is very rare, but it probably doesn't demand the high prices the more common Sand Scorcher does, as it's less known and sought after. A rare bird, get one if you find it! 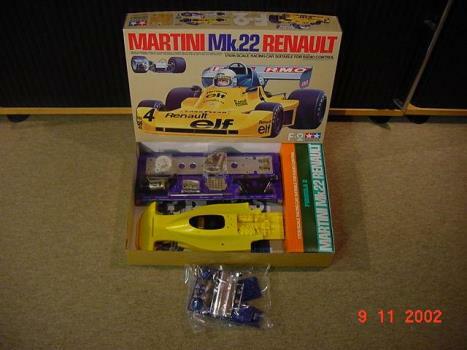 Now about how I got my own Martini Mk.22 Renault: This car will always be a bit special to me. Not for it's looks, handeling or speed. 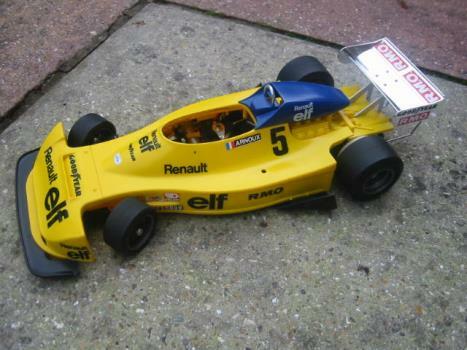 It was this car that I noticed when picking up some junk (from the guy from the old LSH I used to buy). 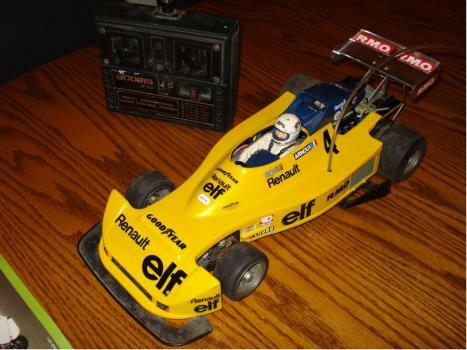 Next few days he had it for display in his store, which didn't sell RC cars anymore. Everytime I went there I was looking at it. It was kinda funny: that front spoiler, huge rear wheels, the chrome rear wing. And it looked so real! I could drool all the time. A great while later, I heared he wanted to sell it. I directly ran to his (new) store, we where discussing it but we never mentioned a price. Many visits later he just called some number and I agreed with it. I was later told he wanted to sell it to me specificly, because je didn't want some idiot bashing it up as a cheap toy. I felt pretty honored he said that. When I walked out that store, I felt like the King of the World carrying his crown. Needless to day, I am VERY happy with it. This won't ever be sold; as I promised the seller not to.